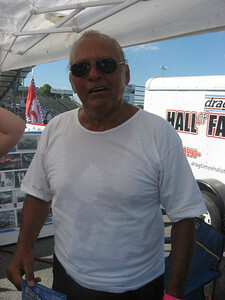 The inaugural Legends at Budds Creek event is taking place at Maryland International Raceway, Budds Creek, Maryland, on June 25 and 26. 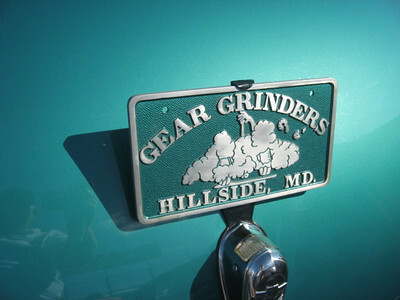 Here are some of the people and cars in attendance on Friday afternoon. 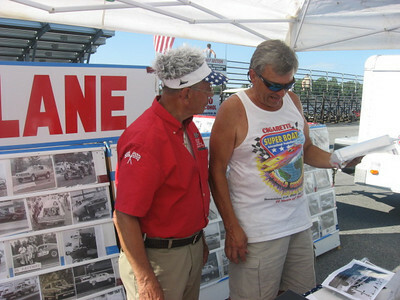 Royce describes the genesis of the Legends at Budds Creek event with Johnny Rocca, who was there at the beginning of the plans for the race a year and a half ago. 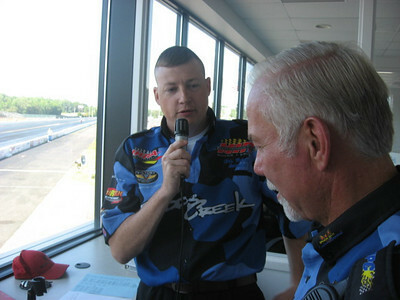 MIR announcer Chris and Royce Miller discuss the event. 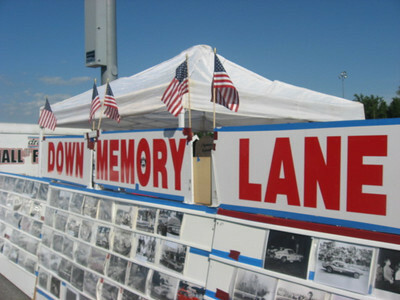 Down Memory Lane with flags a flyin'. 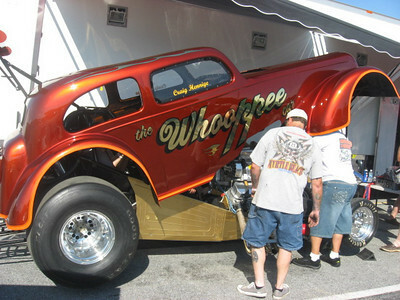 Dale and Ellen Broderick's immaculate candy apple fuel coupe. 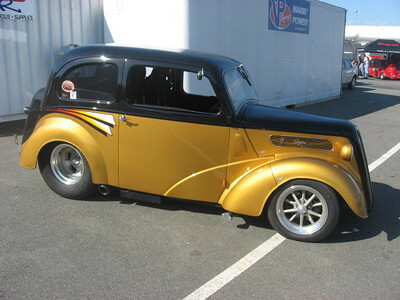 Dale and Ellen Broderick's gorgeous fuel coupe was on hand. 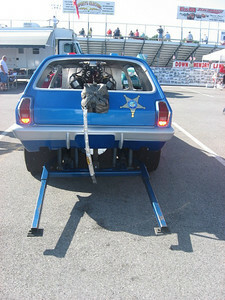 "Sparks end" of the Paddy Wagon wheelstander. 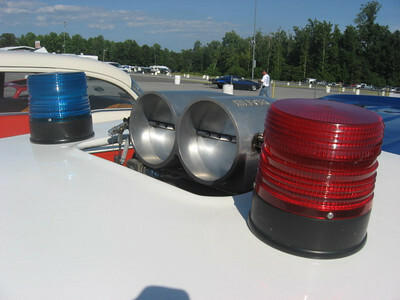 Injectors and gumballs... must be the top of the Paddy Wagon wheelstander! 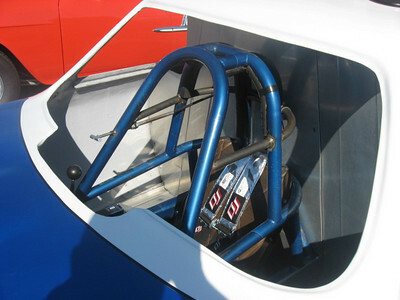 The roll cage of the Paddy Wagon wheelstander. 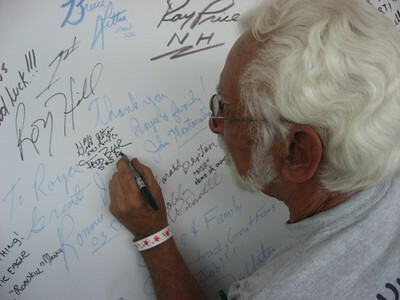 Legendary promoter Julio Marra is still going strong at 80. 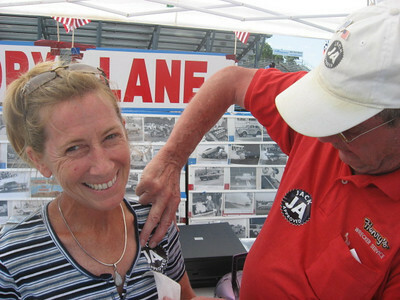 Here he helps a car guy find the photo he wants. 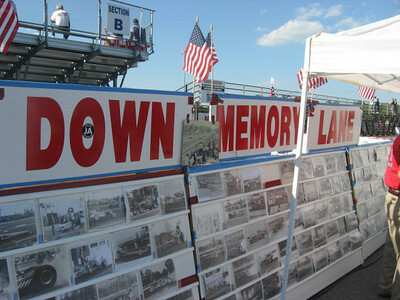 Julio Marra's Down Memory Lane display. 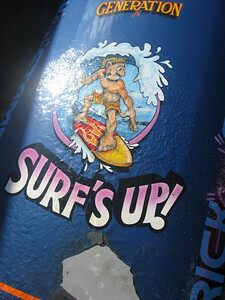 Julio had a printer online and made copies of any of the amazing photos for a small donation. 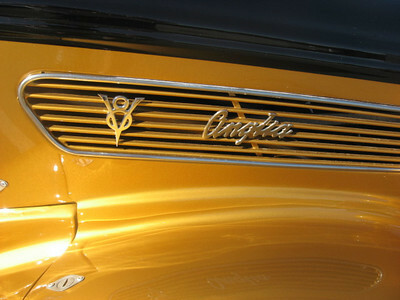 Detail on Angia... hey, a V8 fits in that thing? 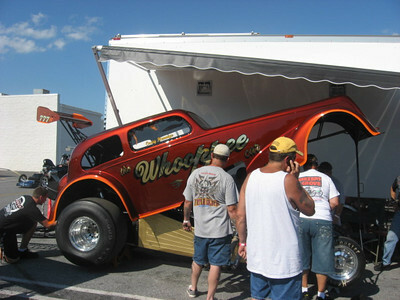 New Whooppee Car resurrected as a blown alcohol funny car. 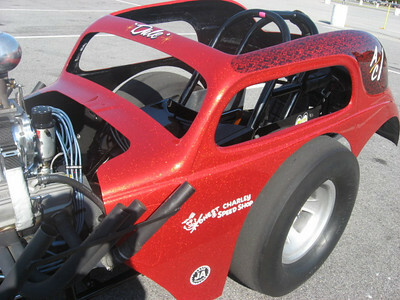 Rick "Surf" Stambaugh was on hand with the Corvette BB/FC, the New Generation alky dragster, and also was helping with the Whooppee Car BB/FC. 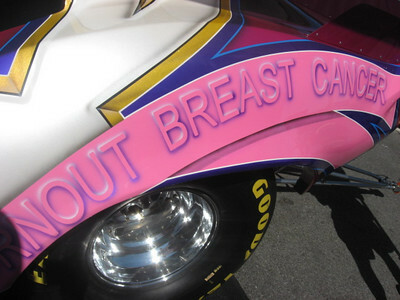 The New Generation dragster cowl showed the results of many, many quarter mile battles. 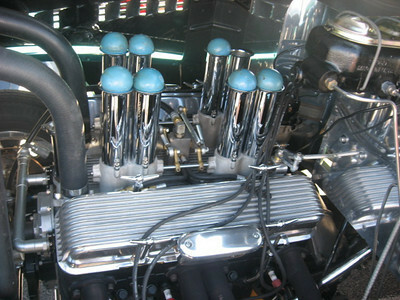 Potent injected Chevy mill in the Jolly Dolly. 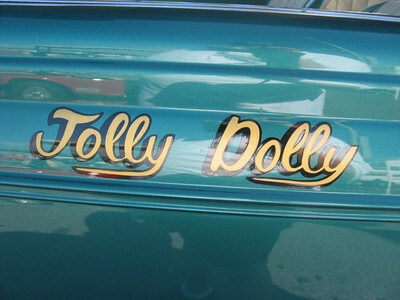 Detail on the Bob Bernardon Jolly Dolly 39 Chevy. 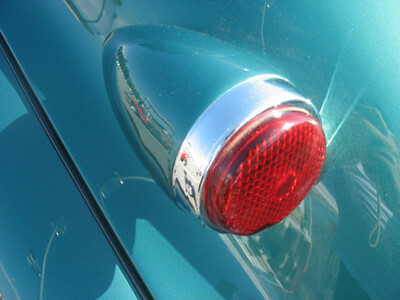 Detail on the Bob Bernardon Jolly Dolly 39 Chevrolet. 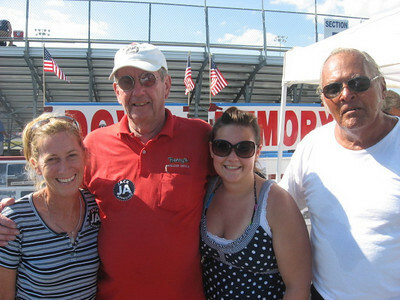 Jack and Ray Gramlich with Ray's lady friend and niece. 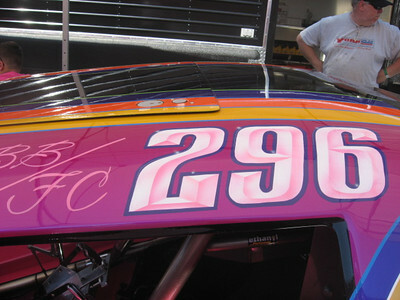 Jack strategically applies a Jack Approved decal to another unsuspecting victim. 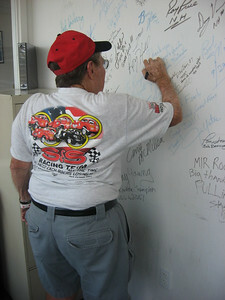 Original MIR track manager and top fuel racer Ray Gramlich was on hand to share memories of MIR with his pals. 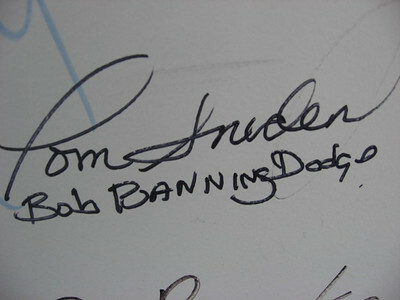 Tom Sneden's signature on the MIR Announcer Booth Wall of Fame. 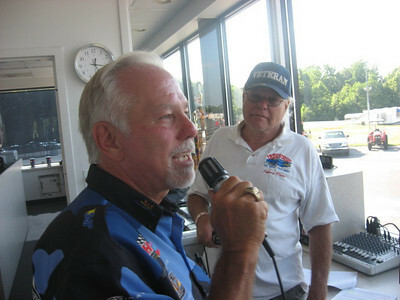 Ram Gramlich, who was the first track manager at MIR in addition to being the driver of the Kemo Saby fuel dragster, put his John Hancock on the MIR Announcer Booth Wall of Fame. 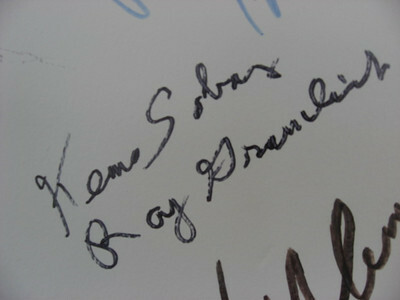 Gene Altizer and Fred Bear signatures on the MIR Announcer Booth Wall of Fame. 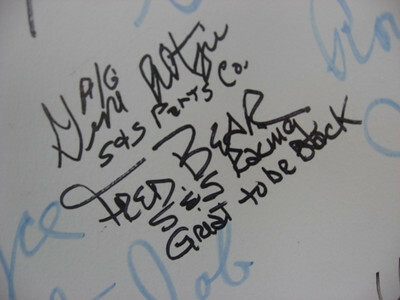 Fred Bear adds his name to the MIR Announcer Booth Wall of Fame. 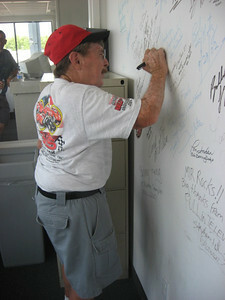 Gene Altizer signs the MIR Announcer's Booth Wall of Fame. 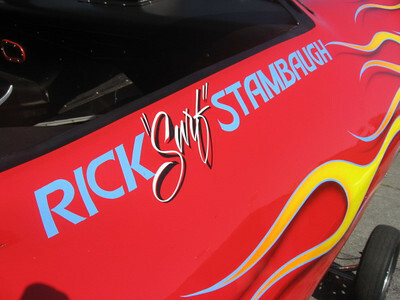 Bunny Burkett debuted her immaculate 79 Corvette nostalgia funny car at the MIR Legends at Budds Creek event.